Hasbro was ubiquitous in the 80’s in the way Disney and Pixar are today. Everyone who grew up during that time was more than familiar with the toy company’s variety of franchises. One of its most successful ventures was the My Little Pony franchise, which is currently undergoing a successful reintroduction. Whether you were a fan back in the 80’s or just a recent devotee, it doesn’t matter. 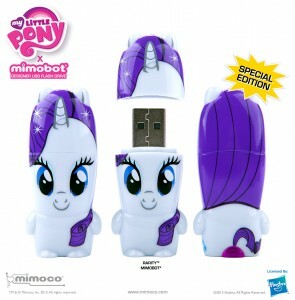 What matters is that our good friends at Mimoco, in collaboration with Hasbro, has released a brand new line of USB flash drives that indulges your My Little Pony enthusiasm. Mimoco expands its nostalgic MIMOBOT line once again, but this time with the My Little Pony franchise. 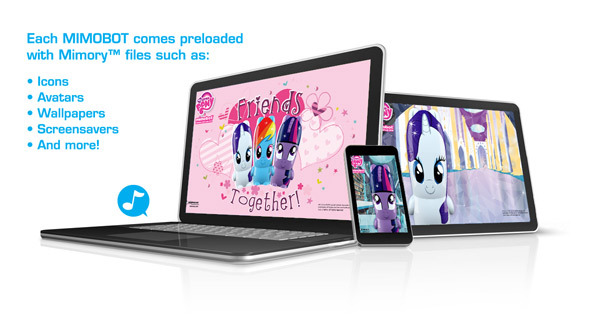 The manufacturer of designer flash drives is offering three My Little Pony flash drive models. The three My Little Pony Mimobots offered by Mimoco are Rarity Mimobot, Twilight Sparkle Mimobot, and Rainbow Dash Mimobot. Each one has its own features, largely related to its name. 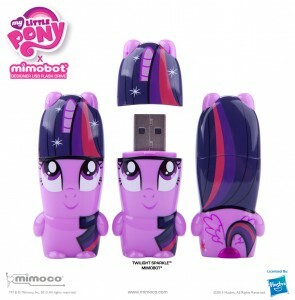 Rarity Mimobot is, for example, a limited edition flash drive. Only 500 pieces of Rarity have been manufactured for consumers and made available only through mimoco.com. Still, whoever is lucky enough to get her can marvel over the intricate details that went into that flash drive design. Next up is Twilight Sparkle Mimobot, designed with sparkling “cutie-marks” similar to Rarity’s with “starry eyes” to boot. This flash drive model boasts a memory storage capacity that goes up to a whopping 128 GB. Last one in is Rainbow Dash. The Rainbow Dash Mimobot focuses on high speed performance, promising speeds that can either match or surpass those of other USBs in the market. 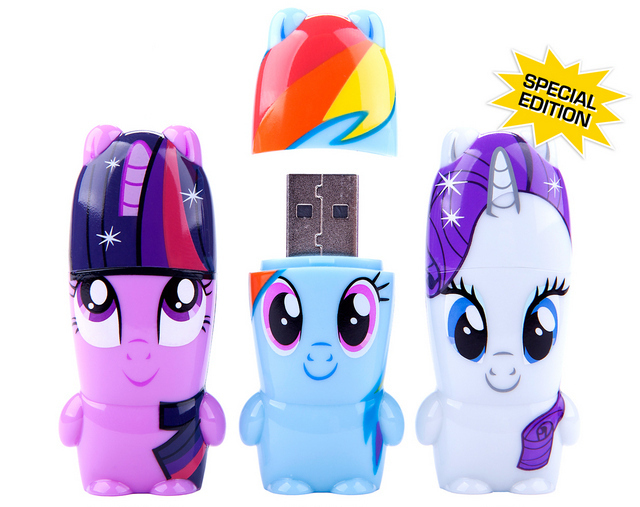 Each My Little Pony MIMOBOT comes with content (wallpapers, icons, avatars, MimoByte sound software, and a complete digital copy of the My Little Pony comics, a couple of videos, and a preview of a My Little Pony watercolor adventure book) pre-loaded into the USB drives. 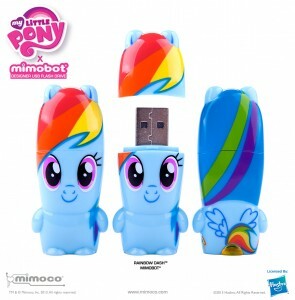 If all this has excited you as a My Little Pony’s fan or relative/friend of one, then you can get your hands on these USB flash drives through select Mimico retailers or through the official website itself, www.mimoco.com. This entry was posted in Mimobot, Mimoco and tagged Hasbro, MIMOBOT, Mimoco, My Little Pony. Bookmark the permalink.